If they had known what it would be like after their swim in the lake, I’m pretty sure they would have opted for the pool. But I still would have gone. I love adventures like this. Why? The IQ demands it. My friend Elizabeth, and her kids, were such troopers to trek out with us to the northern end of the Great Salt Lake. Elizabeth and I went to High School together. I’ve had more laughs with her than almost anyone. And as we get older, I become more and more grateful for her friendship. For years I’ve been wanting to visit the Spiral Jetty. An unbelievable work of earth-art, crafted on the north shore of the lake. It is made mostly of mud, salt crystals, and basalt rock and appears when the water is low. It was created in 1970 by Robert Smithson, who was drawn to the area for the blood-red water (see below) and its connection with the primordial sea. Smithson died in a plane crash only three years after completing the jetty (at age 35), while surveying a location for his next project in Amarillo, TX. Elizabeth and I tried to get everyone appropriately clothed and geared up, but they were scrambling down the rocks before we could get out of the car. The jetty was amazing. Incredible that for so many years this earthscape has resisted time and the elements. After walking around the jetty we decided to journey out to the lake, which was probably half a mile west of us. For a swim. This place was unlike any I had seen before. Mysterious and unearthly. Like treading across the surface of a new moon. And while it looked like a sandy beach stretching out before us, the sight was deceiving. Definitely not a place for bare feet. These pockets of crusty salt water looked like ice. They even crunched like ice. But they were so hot, I yelped when my toes cracked the surface. The kids got to the water way before we did and couldn’t hear us yelling to keep their shoes on. By the time we caught up with them, everyone was limping and wailing. They had gone in barefoot and the salt crystals were like walking on cut glass. But check out this beach of salt. Stretching and curving for miles to the south. I love this photo of Ali. The kids put their runners on and headed back out. Isn’t that red water stunning? It turns this color because of microscopic algae that only grows at a salinity of 21% or more. Similar to the water in the Dead Sea, it feels oily and smooth. And it was as warm as a bathtub. Beautiful Elizabeth. I’m so glad we were together. She has the best sense of humor. I don’t think I would have survived it, all the whining and complaining, without her ability to laugh. Our one request of the kids was that they try floating. It’s a sensation you have to experience! As soon as we took our feet off the ground, they popped out in front of us. It was crazy to bob in the water with absolutely zero effort. Like sitting in an invisible inner tube! Word to the wise though: Don’t put your head under or get your lips near the water. You’ll be spitting salt for a while. See Spencer holding his breath? It was about now that Elizabeth’s boys decided they were done. My kids were quick to follow. Bare feet on the crusty lake floor did them in. Everyone had tiny cuts that were now stinging and burning because of the salty water. Just a few of the lovely sentiments we heard. Ali and Elizabeth stuck around so I could take a quick float. All by my lonesome, but it was so relaxing. After my float, we gathered up our things and followed the kids back to the car. Legs, arms, torsos, covered in a visible layer of salt crystals that chafed when you walked. Sami was mad as a hornet over the whole experience, saying she never would have come if she’d known it was going to be this miserable. So right there she threw down her clothes on the cracked, desolate surface and refused to go any further. I wish you could have seen her rankled face. After I pointed out that setting up camp for the night in the middle of nowhere might not be the best idea, she picked up her clothes and stomped onward. Needless to say, we were the last two to the car. All of our clothes were starched with salt – so stiff the boys’ trunks stood up on their own. I brought jugs of water so we could rinse the salt off, and a change of clothes for all the kids, which helped, but not entirely. I hustled up the hill to get a better shot of the jetty before we drove off. Look at the lake beyond. Other-worldly. Then five minutes into our washboard road exit, my thighs were burning so bad from the salt, we had to pull over so I could rinse my legs again. Misery. Grumbling. And wo is me… for another 15 minutes. Then it got better. And we finished the trip with dinner at Maddox’ Drive-In. Where we compared salt crystals and ordered chocolate shakes. Spencer’s ear gives you an idea of how our legs and arms looked. French fries and a good burger will quell most gripes. Ask the kids about it and they’ll tell you it was a once in a lifetime experience. Meaning, they never need to do it again. But I’m so glad we went. 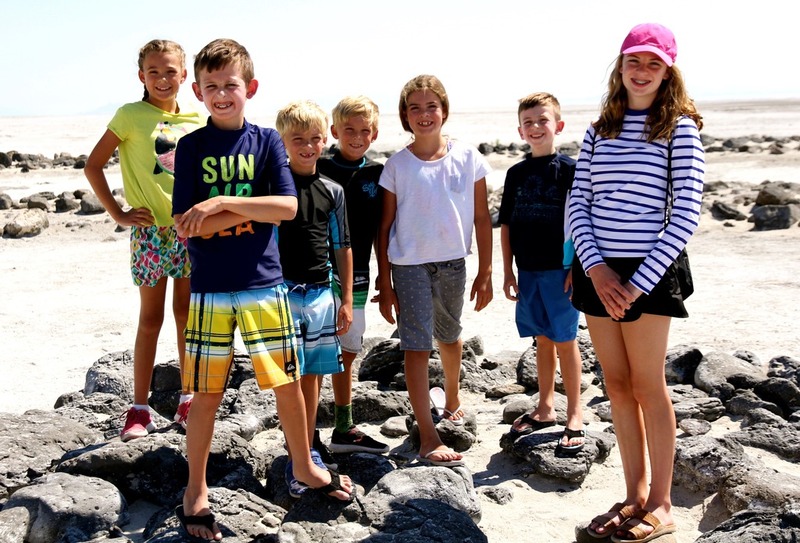 They’ll never forget floating in the Great Salt Lake. And neither will I. A must-do, I think, if you live in Utah. 1. make sure you have a tank full of gas. 5. bring jugs of water to rinse off with. 6. bring a change of clothes and two pairs of shoes. 7. wear shoes at all times. 8. google maps will get you there without a hiccup. 9. stop at golden spike national historic site if you have time (it closes early). 10. grab dinner at maddox. How cool! I've always wanted to visit the great salt lake – I'll have to remember these tips. Oh Cath, I couldn't help but laugh! I hope you've all recovered from the traumas. That shot of you floating alone is lovely. Cath, I love this recap of your trip. It makes me actually want to go, just for the experience. Seems like you all need t-shirts! I find that some of the best memories come from things like this too. We have had our share of "mom – WHY are we doing this?" moments too. Also, the Penderwicks, so great. We listened to book one this summer and now I think I need to go get book 2.